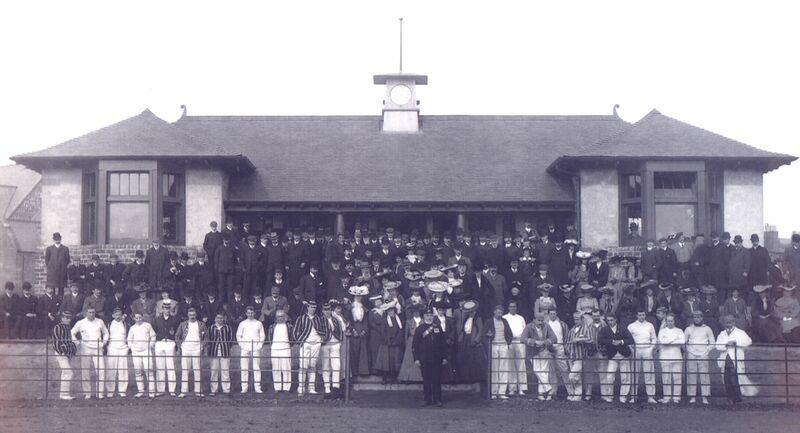 Ebenezer Hendry and Clydesdale Cricket Club. 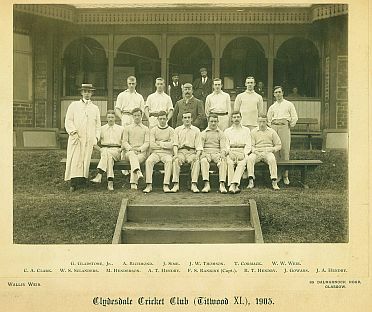 EBENEZER 111 & CLYDESDALE CRICKET CLUB. Clydesdale Cricket Club had been founded in 1848, and their first games were played at a field in Kinning Park leased of a Mr. Tweedie, "cow feeder". For the following season, 1849, Clydesdale had leased fields from a Mr Meiklewham, just west of the newly built General Terminus Railway in Kinning Park, and it was there that they remained until 1876. By the 1860's Clydesdale was one of the premier cricket teams in Scotland and THE premier cricket team in the West. When, in the late 1860's, they began to play football, they soon established a reputation in that sporting sphere also, culminating in their appearance in the first ever Scottish F.A. Cup Final in 1874 versus Queens Park. It also recorded that in 1873 the infant Glasgow Rangers were gratified to be given a game, and even more pleased to hold the Clydesdale to a draw. According to "As Centuries Blend", a book written in 1954 to celebrate 106 years of Clydesdale Cricket Club, Ebenezer 111 first joined the Club in 1860. When he joined, little would he have imagined what he was starting. * This is erroneous -Ebenezer 111 died in 1914. The Opening of the new pavilion of Clydesdale Cricket Club at Titwood, Pollokshields. I would assume that somewhere in this photo are representatives of the Hendry Family!! or provide any additional information please contact me. Not only was his grand-son a member, but his great-grandson, John G.M. Hendry, (the author), was also a member up until his mid-teens (circa 1970), making 110 years of family membership. 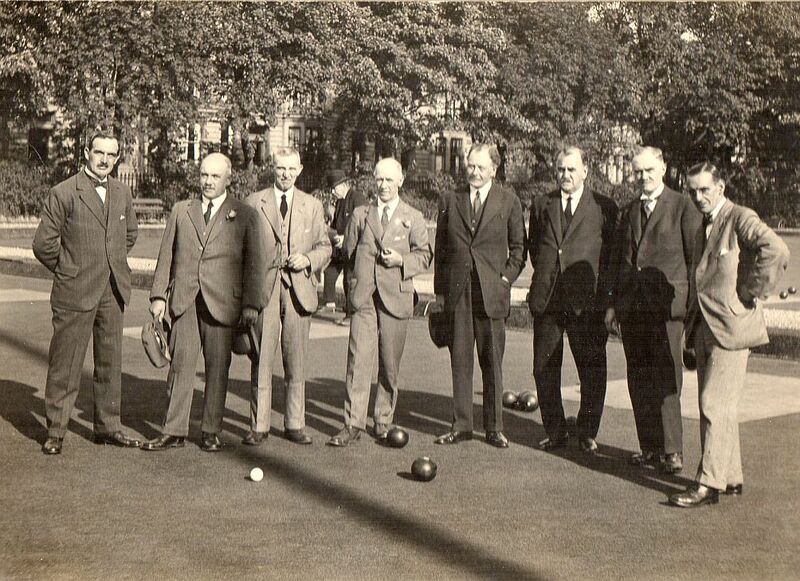 A founder member of the Club was Archie Campbell, latterly a personal friend of Ebenezer 111's. A scrapbook kept by him covering the period from the beginnings of the club in 1848 through to the 1890's, is held in the Glasgow archives of the Mitchel Library. From it the following information, and selection of cricket, football, and other newspaper reports appertaining to Ebenezer 111 are taken. Ebenezer 111 joins Clydesdale according to "When Centuries Blend". 15th July - First record of Ebenezer 111 playing for Clydesdale C.C., against Perth. Caught and bowled for a duck! Ebenezer 111's Season Batting Av. - 5 4/5ths -58 runs in 10 innings. Ebenezer Hendry's name appears in a list of members in the Glasgow Directory of 1867, when the annual subscription for ordinary members was £1 11s 6d, and honorary members was £1 1s..
An Alexander Glen was vice-president for this year. Whether he was in any way related to the Alexander Glen, the maternal grand-father of Agnes Williamson, Ebenezer 111's wife, is not known. (SEE SEPARATE WILLIAMSON FAMILY HISTORY). Ebenezer 111's 1867 Season Batting Av. - 6 8/9ths - 62 runs in 9 innings. At the Clydesdale C.C. Ebenezer 111 proposed the toast to "The Press". Ebenezer played for the North. He went into bat third and was caught by K.McDonald, bowler McPherson for 5 runs. North were victorious by 8 runs. Ebenezer again went into bat third and was bowled for 9 by Orr. He had a success in the field catching Stark of the bowling of D.Duff for a duck. For this match Ebenezer batted fifth. He was caught and bowled by Craig for 8. Although Clydesdale ha a 2nd batting innings Ebenezer does not seem to have taken the crease. Ebenezer 111's Season Batting Av. - 11 9/15th - 173 runs in 15 innings. His 41 runs scored against Greenock on 8th May was a small part of the total of 260 scored by Clydesdale against Greenocks 36. Ebenezer 111's Season Batting Average, according to the newspaper report was 5 1/2th - 77 runs in 14 innings, with a high of 21. Club records give him 6 4/5ths - 68 runs for 10 innings. The highest score was a 43 against Greenock, but only reached after the wicket-keeper fumbled and dropped a catch off Ebenezer 111's second ball. Unlike the previous year Greenock emerged the victors in this match. At the Annual Dinner at the McLeans Hotel Ebenezer 111 proposed the toast to "the Strangers". Ebenezer 111's Season Batting Av. - 13 1/4th - 53 runs in 4 innings. Elected Honorary Secretary of the Club. Played for the 2nd Eleven versus Dumbreck on 23rd August, scoring 1, not out. Ebenezer 111's Season Batting Av. - 2 - 4 runs in 2 innings. At the inaugural meeting of the S.F.A., Ebenezer 111 was voted onto the committee, along with William Gibb, another member of Clydesdale. Archie Campbell of Clydesdale was voted in as the first S.F.A. president. An athletics event organised by the members. In the handicap foot-race (100 yards) for a cup presented by Mr A. Campbell, a Mr Henry came 2nd. I cannot be certain that the Mr Henry in this article is actually Ebenezer 111, but I am fairly certain, the spelling of Henry/Hendry being somewhat fluid in these times. Again Ebenezer played in the forwards, his fine dribbling being commented on in the match report. Clydesdale won 1-0. Ebenezer again played in the forwards, and again his play received mention in the match report. Clydesdale won 4-0 to qualify to play Queens park in the final. Although again Ebenezer was listed in the team as a forward it is his play in defence that gets a mention in the match report. Clydesdale lost 2-0. E. Hendry did not play, a newspaper report of the time stating - "The Clydesdale were deprived of two of their best players - Messrs Gibb and Hendry." His absence may be because Ebenezer 111 had left Glasgow and returned to Stirling after the death of his father on 13th May 1874. Although living in Stirling for the next 18 years he maintained his membership of Clydesdale. Ebenezer 111 returned to Glasgow. Ebenezer 111 was a "Croupier" at the Clydesdale Jubilee Dinner.